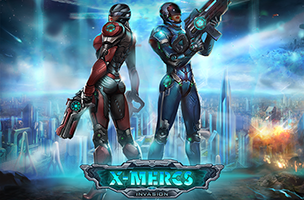 Mobile and social game developer and publisher Game Insight has announced X-Mercs: Invasion for iPad. The strategy game takes players to the year 2040, as they join a scientific and military corporation to defeat an alien invasion bent on destroying both humans and Earth. The game’s story concerns two warring factions, the North Atlantic Defense Alliance and the Red Dragon Union. The two are locked in a war over newly discovered, energy-rich crystals known as “Advinite,” which, while powerful, have also triggered the mutation of creatures into mutant monsters. The alien invasion only adds to the chaos and global devastation, forcing players to take matters into their own hands to stop the aliens before things get worse. In X-Mercs: Invasion, players will construct a base of operations, which houses an army of mercenaries from around the world. Players can research new weapons using the aliens’ own technology, and will build a squad of soldiers including heavy gunners, snipers and scouts, changing their equipment to fit their current needs. Battles are turned-based, and look to resemble those found in other strategy games, including X-COM: Enemy Unknown. Players can assign units to attack or take cover, with battles playing out across futuristic 3D environments. X-Mercs: Invasion will come to iPad first, before branching out to other mobile platforms. Check back soon for more, and to follow the game on AppData, our tracking platform for mobile and social apps and developers.